Heat oven to 450°F. In 10-inch skillet, cook ground beef over medium-high heat, stirring frequently, until thoroughly cooked; drain. Reduce heat to medium. Add onion; cook 5 to 8 minutes, stirring occasionally, until onion is tender. Stir in ketchup, pickle and pepper. Cook 2 to 3 minutes or until thoroughly heated. Spoon mixture into ungreased 9-inch pie pan. Sprinkle with cheese. 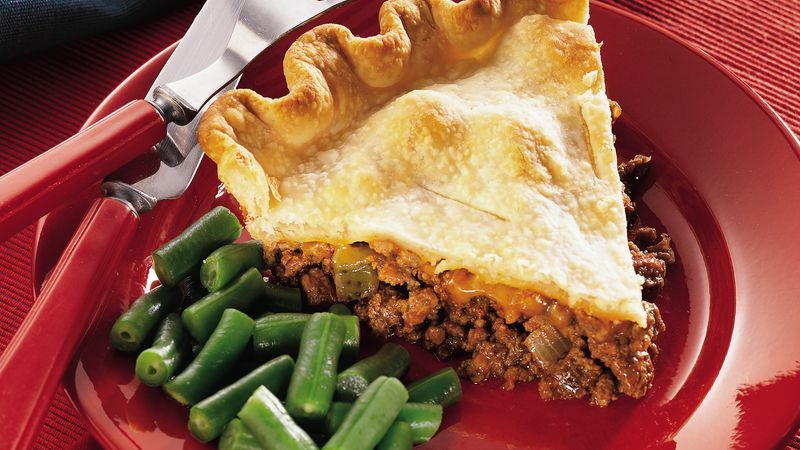 Remove pie crust from pouch; place flat over hot beef mixture. Seal and flute edge; cut slits in several places in crust. Bake 13 to 20 minutes or until crust is golden brown and filling is bubbly. After 8 to 10 minutes of baking, cover crust edge with strips of foil to prevent excessive browning.